Looking for the ideal dress that will keep up with your adventures this Spring? Brooke Williams, of the Tony Townie finds the Yarldey Dress and Topanga Dress to be the perfect fit for her everyday adventures as mom. Discover her styling tips below, and follow her at www.thetonytownie.com or on Instagram @brooklynnc82. I find it fascinating to reflect on how our wardrobe choices evolve with us as we move through seasons of life. What we value in a piece of clothing changes as we do — the look, the fit, the fabric, the price. Do you ever think back and cringe at how tight and cropped some of your clothes were? Or how awesome you thought a terry cloth halter top looked with a tattoo choker and bedazzled jeans? In this current season of life, as a stylist and a stay-at-home mom, it’s like I work two jobs. My mom clothes are like my work clothes. Do I need them to comply with a business casual office dress code? Well, no, not necessarily (though any piece that can pull double duty is a friend indeed!). But whether or not you’re a SAHM or you work outside of the home, you want comfortable, moveable, stylish clothing when you’re mommin’ so hard. Forget awkward mom jeans. Forget schlubby twin sets and dingy ballet flats. Forget the dowdy mom uniform of days past. We’re living in an age of sophisticated mom style — now you just have to find the pieces and brands that speak to you! In the spring and summer time, I shop for dresses. I look for machine washable fabrics, and silhouettes that flatter the figure but won’t expose my bathing suit areas every time I have to chase Harlow down or wrangle her into her car seat. I want that ‘fashionable yet functional’ piece that makes me feel pretty but doesn’t require a lot of fuss. Or strapless bras. I discovered this clothing line called Aventura, a brand dedicated to designing comfortable and fashionable clothing with a “low environmental impact.” They use organic and sustainable fibers in their clothing that’s meant for an active woman’s lifestyle. But ‘active’ doesn’t just mean working out or training for a Spartan race (although they do have traditional active wear in their collection.) It means actively living your life. Exploring on the weekends. Traveling to new places. Living your everyday adventures, full of to-dos, errands, and obligations. I love these two Aventura dresses for all of the above reasons. When I received my shipment, I was hopeful but hesitant, waiting to see what this new brand would look like and feel like in person. Y’all. You’re looking at two dresses that I will be wearing in heavy rotation. The fabrics are durable yet lightweight, and the prints are classic and feminine. 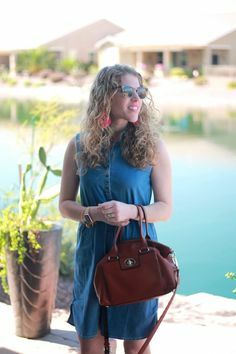 These dresses are exactly what I look for in stylish, everyday pieces for spring and summer. The orange floral dress (pictured above) is the Yardley dress and also comes in indigo and black. It’s got a faux-wrap silhouette and tulip hem. Between the cut and the print, it defines my figure into a nice hourglass shape. It looks fantastic with neutral ankle booties and sandals! I’m wearing a small and it fits TTS. 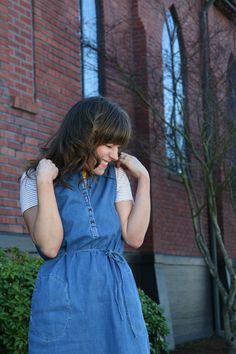 This striped dress is the Topanga dress, and I love it for how French inspired it is! A cotton striped bateau dress is a closet staple you can wear year after year. This dress also comes in coral, green, and black stripes. I was nervous about the cap sleeve but it’s slightly longer so it doesn’t cut your shoulder off in a bad place. And it has pockets! Love the pockets. This piece has great versatility and can be styled to suit several occasions. With sneakers it’s great for weekending, but with a blazer and flats it could be dressed up for the work place or meetings. I love the length of this one, too. It’s not too short or too long. (I’m 5’8″ for reference.) I’m wearing a small and it fits TTS. To view Brooke’s original blog post, visit www.TheTonyTownie.com. 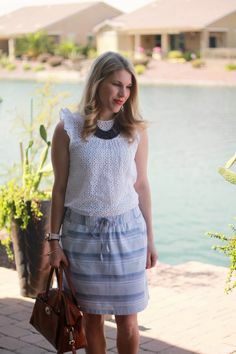 Bring on Spring: Get the Look!